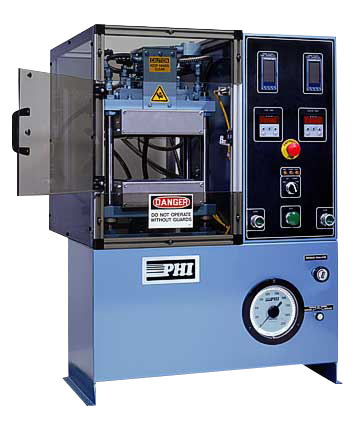 Standard air actuated presses that incorporate PHI’s specialized platen designs and advanced pneumatic/air over oil systems into a precision four post press. Intended for applications requiring accurate control of pressure, temperature and parallelism. Standard models with capacity rated from 2,000 lbs. to 60,000 lbs. Standard models with die space, or platen size from 8” x 8” to 18” x 18”. bushings and chrome plated strain rods with fine threads for optimum parallelism alignment. your application. 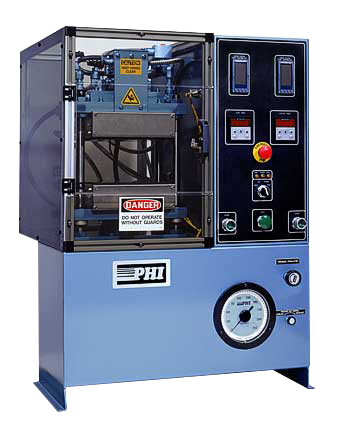 As different applications call for different temperature ranges, heat rise, temperature uniformity and heating modes; we at PHI have designed a complete line of platens ranging from standard industrial platens to exotic high temperature platens for laboratory applications. No matter what your application, proven PHI platens are the answer. 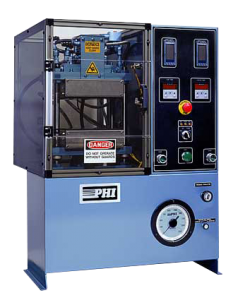 All PHI platens utilize special thermocouples, one for each platen, and time proportioning temperature controllers to prevent over-shoot and to provide uniform, predictable heating. 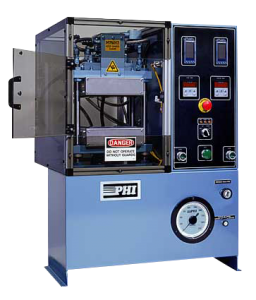 We at PHI are aware that special applications may require special features in a press above of what is offered in our standard Precision Presses. For these special applications we have developed features such as nickel alloy platens for temperatures up to 1200°F, special heaters for heat rise up to 50°F/min., 1/4% accuracy temperature controllers, controlled platen cooling, and many others. We solicit your special applications — please contact us.